Are you considering deploying HPE Cloudline servers in your hyper-scale environment? If you are, be aware that HPE now offers select Cavium ™ FastLinQ® 10GbE and 10/25GbE Adapters as options for HPE Cloudline CL2100, CL2200 and CL3150 Gen 10 Servers. The adapters supported on the HPE Cloudline servers are shown in table 1 below. As today’s hyper-scale environments grow, the Ethernet I/O needs go well beyond providing basic L2 NIC connectivity. Faster processors, increase in scale, high performance NVMe and SSD storage and the need for better performance and lower latency have started to shift some of the performance bottlenecks from servers and storage to the network itself. That means architects of these environments need to rethink connectivity options. 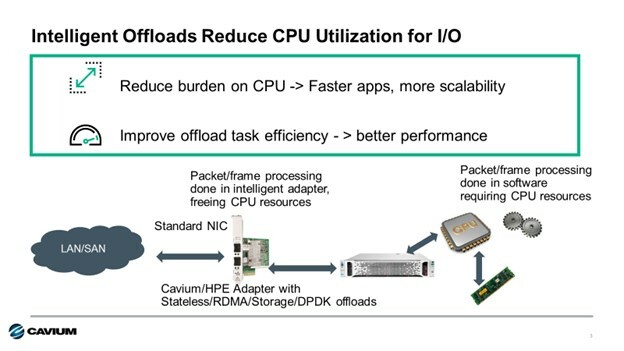 While HPE already have some good I/O offerings for Cloudline from other vendors, having Cavium FastLinQ adapters in the portfolio increases the I/O features and capabilities available. 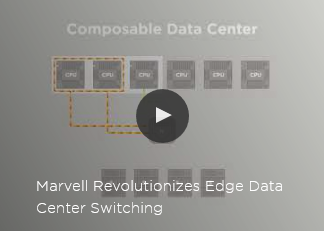 Advanced features like Universal RDMA, SmartAN™, DPDK, NPAR and SR-IOV from Cavium, allow architects to design more flexible and scalable hyper-scale environments. To deliver these benefits, customers can take advantage of some or all the advanced features in the Cavium FastLinQ Ethernet adapters for HPE Cloudline. Here’s a list of some of the technologies available in these adapters. Network Partitioning (NPAR) virtualizes the physical port into eight virtual functions on the PCIe bus. This makes a dual port adapter appear to the host O/S as if it were eight individual NICs. Furthermore, the bandwidth of each virtual function can be fine-tuned in increments of 500Mbps, providing full Quality of Service on each connection. SR-IOV is an additional virtualization offload these adapters support that moves management of VM to VM traffic from the host hypervisor to the adapter. This frees up CPU resources and reduces VM to VM latency. Remote Direct Memory Access (RDMA) is an offload that routes I/O traffic directly from the adapter to the host memory. This bypasses the O/S kernel and can improve performance by reducing latency. The Cavium adapters support what is called Universal RDMA, which is the ability to support both RoCEv2 and iWARP protocols concurrently. This provides network administrators more flexibility and choice for low latency solutions built with HPE Cloudline servers. SmartAN is a Cavium technology available on the 10/25GbE adapters that addresses issues related to bandwidth matching and the need for Forward Error Correction (FEC) when switching between 10Gbe and 25GbE connections. For 25GbE connections, either Reed Solomon FEC (RS-FEC) or Fire Code FEC (FC-FEC) is required to correct bit errors that occur at higher bandwidths. 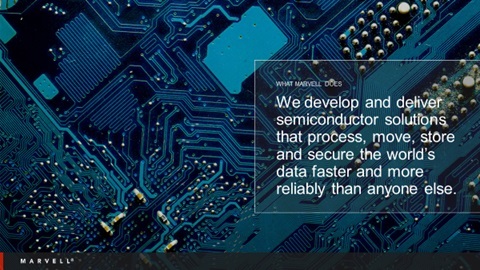 For the details behind SmartAN technology you can refer to the Cavium technology brief here. Support for Data Plane Developer Kit (DPDK) offloads accelerate the processing of small packet I/O transmissions. This is especially important for applications in the Telco NFV and high-frequency trading environments. For simplified management, Cavium provides a suite of utilities that allow for configuration and monitoring of the adapters that work across all the popular O/S environments including Microsoft Windows Server, VMware and Linux. Cavium’s unified management suite includes QCC GUI, CLI and v-Center plugins, as well as PowerShell Cmdlets for scripting configuration commands across multiple servers. Cavum’s unified management utilities can be downloaded from www.cavium.com . Gen10 servers. Each of the Cavium adapters shown in table 1 support all of the capabilities noted above and are available in standup PCIe or OCP 2.0 form factors for use in the HPE Cloudline Gen10 Servers. One question you may have is how do these adapters compare to other offerings for Cloudline and those offered in HPE ProLiant servers? For that, we can look at the comparison chart here in table 3. Given that Cloudline is targeted for hyper-scale service provider customers with large and complex networks, the Cavium FastLinQ Ethernet adapters for HPE Cloudline offer administrators much more capability and flexibility than other I/O offerings. If you are considering HPE Cloudline servers, then you should also consider Cavium FastLinQ as your I/O of choice. When you are baking a cake, at times you substitute in different ingredients to make the result better. The same can be done with VMware vSAN ReadyNode configurations or recipes. Some changes to the documented configurations can make the end solution much more flexible and scalable. However, changes can only be made with devices that are certified as supported by VMware. The list of certified I/O devices can be found on VMware vSAN Compatibility Guide and the full portfolio of NICs, FlexFabric Adapters and Converged Network Adapters form HPE and Cavium are supported. If we zero in on the HPE recipes for vSAN ReadyNode configurations, here are the substitutions you can make for I/O adapters. Ok, so we know what substitutions we can make in these vSAN storage solutions. What are the benefits to the customer for making this change? There are several benefits to the HPE/Cavium technology compared to the other adapter offerings. HPE 520/620 Series adapters support Universal RDMA – the ability to support both RoCE and IWARP RDMA protocols with the same adapter. Why Does This Matter? Universal RDMA offers flexibility in choice when low-latency is a requirement. RoCE works great if customers have already deployed using lossless Ethernet infrastructure. iWARP is a great choice for greenfield environments as it works on existing networks, doesn’t require complexity of lossless Ethernet and thus scales infinitely better. NPAR (Network Partitioning) allows for virtualization of the physical adapter port. SR-IOV Offloadmove management of the VM network from the Hypervisor (CPU) to the Adapter. 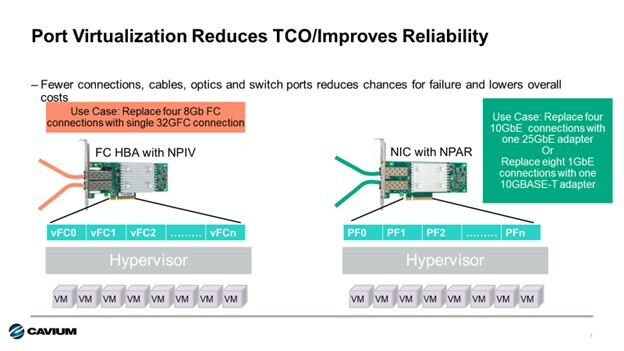 With HPE/Cavium adapters, these two technologies can work together to optimize the connectivity for virtual server environments and offload the Hypervisor (and thus CPU) from managing VM traffic, while providing full Quality of Service at the same time. Ability to reduce CPU utilization by offering iSCSI or FCoE Storage offload on the adapter itself. The freed-up CPU resources can then be used for other, more critical tasks and applications. This also reduces the need for dedicated storage adapters, connectivity hardware and switches, lowering overall TCO for storage connectivity. Offloads in general – In addition to RDMA, Storage and SR-IOV Offloads mentioned above, HPE/Cavium Ethernet adapters also support TCP/IP Stateless Offloads and DPDK small packet acceleration offloads as well. Each of these offloads moves work from the CPU to the adapter, reducing the CPU utilization associated with I/O activity. 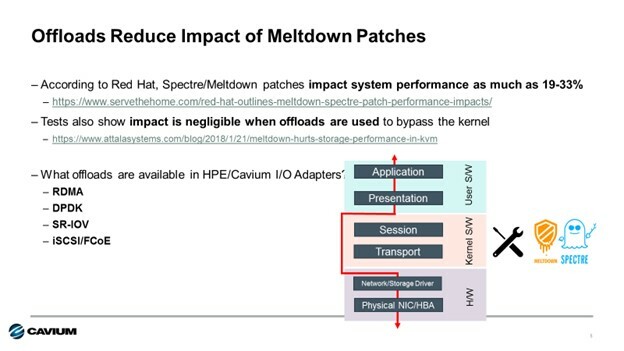 As mentioned in my previous blog, because these offloads bypass tasks in the O/S Kernel, they also mitigate any performance issues associated with Spectre/Meltdown vulnerability fixes on X86 systems. Adapter Management integration with vCenter – All HPE/Cavium Ethernet adapters are managed by Cavium’s QCC utility which can be fully integrated into VMware v-Center. This provides a much simpler approach to I/O management in vSAN configurations. In summary, if you are looking to deploy vSAN ReadyNode, you might want to fit in a substitution or two on the I/O front to take advantage of all the intelligent capabilities available in Ethernet I/O adapters from HPE/Cavium. Sure, the standard ingredients work, but the right substitution will make things more flexible, scalable and deliver an overall better experience for your client. If You’re Not Using Intelligent I/O Adapters, You Should Be! Like a kid in a candy store, choose I/O wisely. Remember as a child, a quick stop to the convenience store, standing in front of the candy aisle your parents saying, “hurry and pick one.” But with so many choices, the decision was often confusing. With time running out, you’d usually just grab the name-brand candy you were familiar with. But what were you missing out on? Perhaps now you realize there were more delicious or healthy offerings you could have chosen. I use this as an analogy to discuss the choice of I/O technology for use in server configurations. There are lots of choices and it takes time to understand all the differences. As a result, system architects in many cases just fall back to the legacy name-brand adapter they have become familiar with. Is this the best option for their client though? Not always. Here’s some reasons why. Some of today’s Ethernet adapters provide added capabilities that I refer to as “Intelligent I/O”. These adapters utilize a variety of offload technology and other capabilities to take on tasks associated with I/O processing that are typically done in software by the CPU when using a basic “standard” Ethernet adapter. Intelligent offloads include things like SR-IOV, RDMA, iSCSI, FCoE or DPDK. Each of these offloads the work to the adapter and, in many cases, bypasses the O/S kernel, speeding up I/O transactions and increasing performance. As servers become more powerful and get packed with more virtual machines, running more applications, CPU utilizations of 70-80% are now commonplace. By using adapters with intelligent offloads, CPU utilization for I/O transactions can be reduced significantly, giving server administrators more CPU headroom. This means more CPU resources for applications or to increase the VM density per server. Another reason is to mitigate performance impact to the Spectre and Meltdown fixes required now for X86 server processors. The side channel vulnerability known as Spectre and Meltdown in X86 processors required kernel patches from the CPU vendor. These patches can have a significantly reduce CPU performance. For example, Red Hat reported the impact could be as much as a 19% performance degradation. That’s a big performance hit. Storage offloads and offloads like SR-IOV, RDMA and DPDK all bypass the O/S kernel. Because they bypass the kernel, the performance impacts of the Spectre and Meltdown fixes are bypassed as well. This means I/O transactions with intelligent I/O adapters are not impacted by these fixes, and I/O performance is maximized. Finally, intelligent I/O can play a role in reducing cost and complexity and optimizing performance in virtual server environments. Some intelligent I/O adapters have port virtualization capabilities. Cavium Fibre Channel HBAs implement N-port ID Virtualization, or NPIV, to allow a single Fibre Channel port appear as multiple virtual Fibre Channel adapters to the hypervisor. For Cavium FastLinQ Ethernet Adapters, Network Partitioning, or NPAR, is utilized to provide similar capability for Ethernet connections. Up to eight independent connections can be presented to the host O/S making a single dual-port adapter look like 16 NICs to the operating system. Each virtual connection can be set to specific bandwidth and priority settings, providing full quality of service per connection. The advantage of this port virtualization capability is two-fold. First, the number of cables and connections to a server can be reduced. In the case of storage, four 8Gb Fibre Channel connections can be replaced by a single 32Gb Fibre Channel connection. For Ethernet, eight 1GbE connections can easily be replaced by a single 10GbE connection and two 10GbE connections can be replaced with a single 25GbE connection, with 20% additional bandwidth to spare. 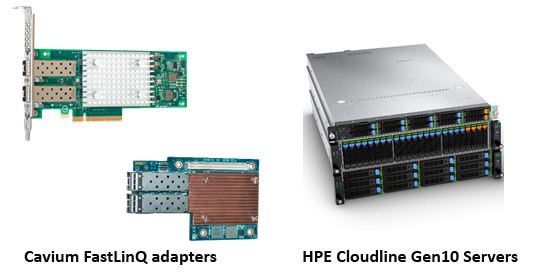 At HPE, there are more than fifty 10Gb-100GbE Ethernet adapters to choose from across the HPE ProLiant, Apollo, BladeSystem and HPE Synergy server portfolios. That’s a lot of documentation to read and compare. Cavium is proud to be a supplier of eighteen of these Ethernet adapters, and we’ve created a handy quick reference guide to highlight which of these offloads and virtualization features are supported on which adapters. View the complete Cavium HPE Ethernet Adapter Quick Reference guide here. For Fibre Channel HBAs, there are fewer choices (only nineteen), but we make a quick reference document available for our HBA offerings at HPE as well. You can view the Fibre Channel HBA Quick Reference here. In summary, when configuring HPE servers, think twice before selecting your I/O device. 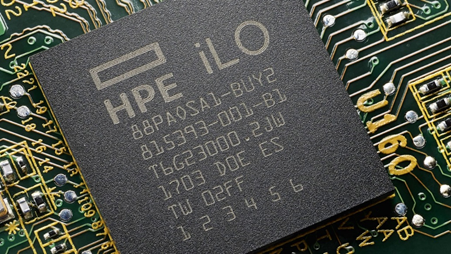 Choose an Intelligent I/O Adapter like those from HPE and Cavium. 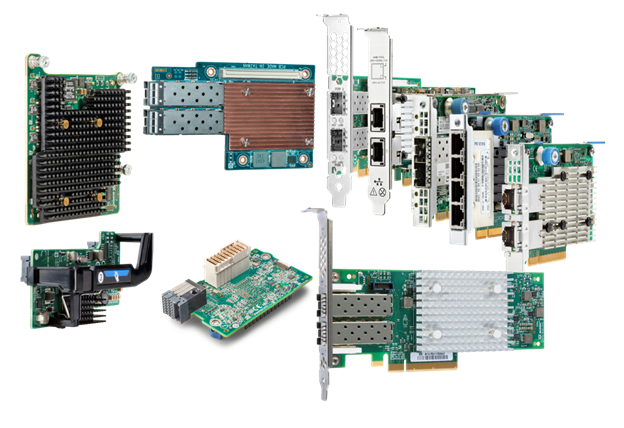 Cavium provides the broadest portfolio of intelligent Ethernet and Fibre Channel adapters for HPE Gen9 and Gen10 Servers and they support most, if not all, of the features mentioned in this blog. The best news is that the HPE/Cavium adapters are offered at the same or lower price than other products with fewer features. That means with HPE and Cavium I/O, you get more for less, and it just works too!